Few things add as much warmth and charm to your Christmas tree as homemade ornaments. Before you choose a recipe, decide whether you are making edible ornaments or keepsakes as there is no need for eggs and sugar in cookies meant to hang on your tree year after year. 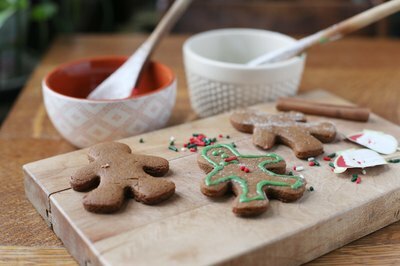 The most important ingredients in gingerbread recipes are flour, butter or shortening, sugar, cinnamon and ginger. Some recipes call for eggs, while others do not. 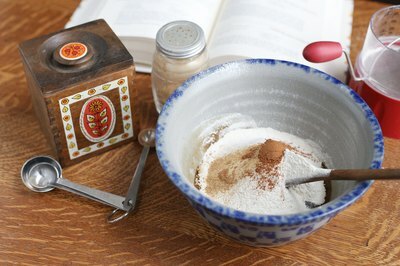 Eggs create a slightly more cake-like dough, so only use them if you intend your ornaments to be eaten. Eggless recipes tend to call for longer cooking times, baking for 20 to 25 minutes rather than 12 to 15 minutes. Once you have mixed the dough, either roll it out into a 1/4-inch-thick sheet and cut out shapes with cookie cutters or sculpt your ornaments freehand as you would when using modeling clay. Remember to poke a fairly large hole at the top of the ornament with a toothpick through which to thread a hanging wire or ribbon. Make this slightly larger than you think you need because it will close up some during baking, and make sure it is not too close to the top edge of the ornament. Edible ornaments only should be decorated with edible icing, sprinkles and shapes or beads made of candy. Apply these to the ornaments once they have cooled but before they have completely hardened so the embellishments stick better. Use royal icing and a pastry bag or thick and thin sugar icing in small squeeze bottles. Use thicker icing to create borders and outlines and thinner icing to fill them in. Red and white are the most traditional colors for gingerbread ornaments but you may use any colors you like. Sugar icing is not expensive to make but if your ornaments are not going to be eaten, there is no reason you have to use edible decorations. Puff paint can pass for tinted icing, and you can affix small beads, googly eyes, tiny pompoms, felt or fabric scraps, and other decorative craft supplies with white glue. Glitter glue adds a bit of sparkle that twinkles in the glow of Christmas-tree lights. 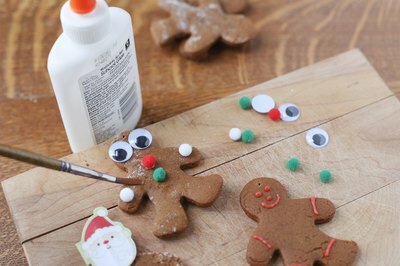 White glue dries clear and is an inexpensive and efficient way to preserve gingerbread ornaments. Mix together equal amounts of white glue and apply the mixture to your gingerbread ornaments once the embellishments have fully dried. Use a small paintbrush to cover the front and the edges. Let this coat thoroughly dry before turning the ornaments face-down and coating the back and the sides. Let this coat thoroughly dry before attaching a ribbon and hanging your ornaments.